Round is the newest and hottest trend in sunglasses fashion. 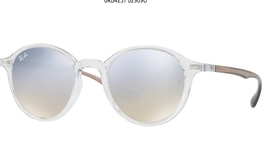 Most major design houses have at least one, and usually several, round sunglasses models in their collections. The round shape is balanced, perfect, and harmonious with nature. It provides great coverage for the eyes and therefore makes for a very practical sunglasses design. And the round shape is also the best shape for progressive lenses, especially for progressive prescription sunglasses.